The main difference between FireWire and Thunderbolt is that Thunderbolt provides a higher data transferring rate than FireWire. 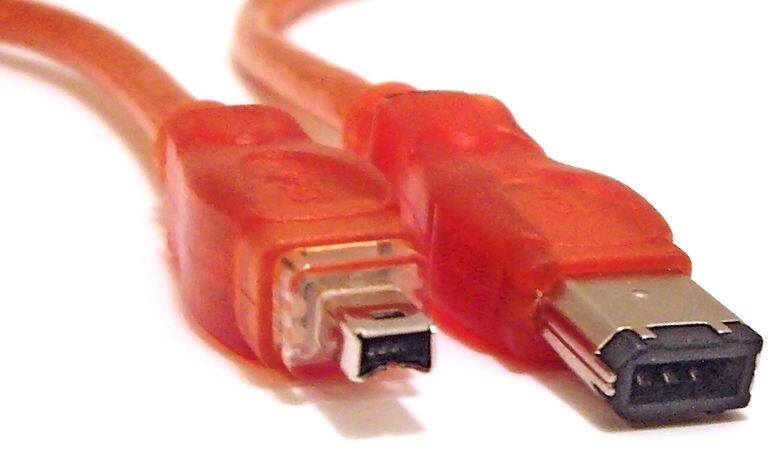 FireWire and USB are standard interfaces to establish communication between electronic devices. FireWire provides a data transferring rate of 400 to 800 Mbps. On the other hand, Thunderbolt provides a data transferring rate of 10Gbps. It is around 12 times faster than FireWire 800 version. Therefore, Thunderbolt is faster and performs better than FireWire. FireWire is an interface that allows high-speed communication and data transferring among devices. It is the Apple version of the IEEE 1394 standard. There are two types in FireWire as FireWire 400 (IEEE 1394a) and FireWire 800 (IEEE 1394b). FireWire 400 provides a data transfer rate up to 400 Mbps, and it is a 6 pin connector. FireWire 800 provides a data transfer rate up to 800Mbps, and it is a 9 pin connector. There are future versions such as FireWire 1600 and 3200 that can support much faster speeds. FireWire provides multiple advantages. It has thin serial cables. Moreover, it is possible to connect devices together without terminators or complicated setup requirements. Most importantly, it builds the pathway to connect peripherals such as external hard drives, video cameras, audio interfaces, etc. Thunderbolt is an interface to connect external devices to a computer. It combines PCI Express and Display port into two serial signals. Therefore, it supports both data devices and displays with high resolutions. Thunderbolt provides a data transferring rate of 10Gbps in both directions. It is a higher rate compared to FireWire. Also, this interface is capable of supporting eight 720p video streams at the same time. 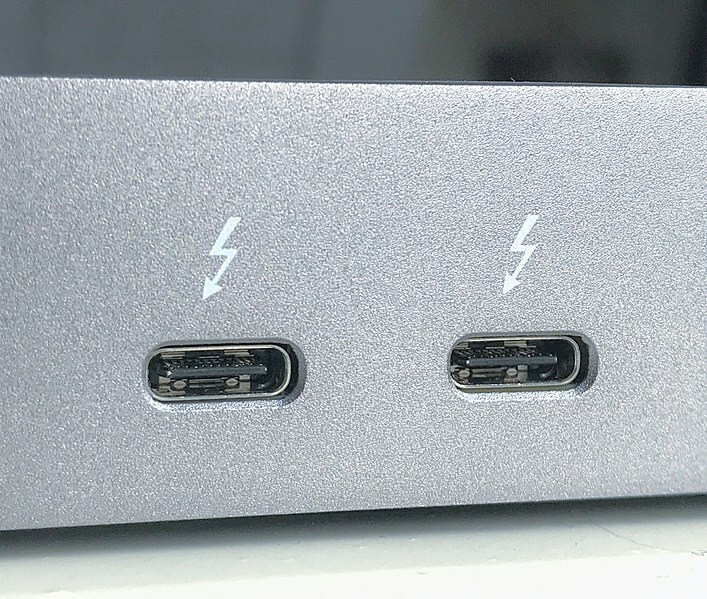 Thunderbolt provides power to connected devices. In other words, it is possible to power an external device that requires 10 watts or less power. Moreover, we can connect multiple devices to one Thunderbolt port in sequence. Thus, it is also called daisy chaining. FireWire is Apple version of a standard, IEEE 1394, high-performance serial bus for connecting devices to personal computers. Thunderbolt, on the other hand, is a hardware interface that allows the connection of external peripherals to a computer. Thus, this is the fundamental difference between FireWire and Thunderbolt. Apple Inc. is the designer of FireWire while Intel and Apple are the designers of FireWire. Speed is the main difference between FireWire and Thunderbolt. That is; the FireWire provides 400-800 Mbps data transferring speed whereas the Thunderbolt provides 10Gbps data transferring rate. Also, it is possible to daisy chain up to 63 devices in FireWire. However, it is possible to daisy chain up to 6 devices in Thunderbolt. Hence, this is a difference between FireWire and Thunderbolt. 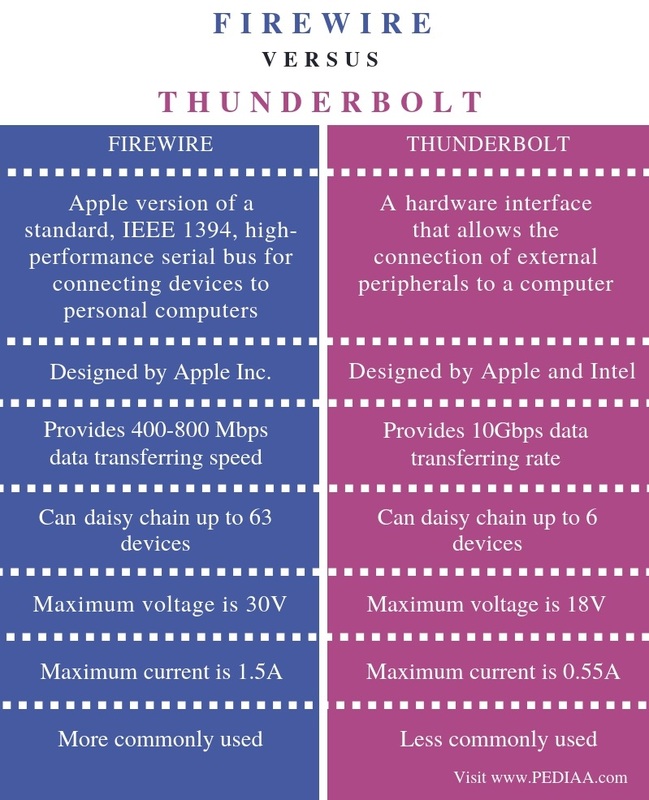 Moreover, one important difference between FireWire and Thunderbolt is that the maximum voltage of FireWire is 30V and the maximum voltage of Thunderbolt is 18V. Maximum current is also an important difference between FireWire and Thunderbolt. The maximum current of FireWire is 1.5A while the maximum current Thunderbolt is 0.55A. FireWire is more commonly used than Thunderbolt. FireWire and Thunderbolt are interfaces to allow communication between electronic devices. The main difference between FireWire and Thunderbolt is that the Thunderbolt provides higher data transferring rate than FireWire. 1. “IEEE 1394.” Wikipedia, Wikimedia Foundation, 31 Dec. 2018, Available here. 2. “Thunderbolt (Interface).” Wikipedia, Wikimedia Foundation, 17 Jan. 2019, Available here. 3. “Firewire.” P2P (Peer To Peer) Definition, Available here. 4. “Thunderbolt.” P2P (Peer To Peer) Definition, Available here.